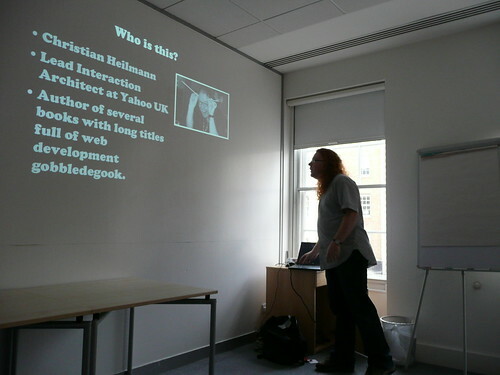 You are currently browsing the Christian Heilmann blog archives for August, 2007. I just came back from giving a presentation on how to cater content distribution via badges and widgets to the right audience and how we fail at it. One of the biggest issues of CSS layouts is that not all columns are the same height which makes it hard to style them in a traditional manner. You can embrace this change as a designer, but that seldomly happens. Having played with YUI grids lately I realized this shortcoming, too. Nested grids don’t have the same height. I am sure you can tweak the CSS to do that (Ed Eliot showed a lot of options how to achieve equal height columns in the past) but I don’t get much fun out of CSS hacking. As the YUI grids come with a defined set of CSS classes I have my hooks to apply JS functionality to and the script was easy to do using YUI Dom and YUI Dom Region. Check out the demo page for equal height nested grids and download the script to use it in your own grid solutions. All you need to do is to add YAHOO, YAHOO Dom and YAHOO Event (easiest with the collated yahoo-dom-event package) and the script in the bottom of your document’s body. The script automatically equals all columns in nested grids. If you don’t want all of them to be equal, define only those that need fixing by adding a “columnfix”CSS class. One of the lesser known gems of the Yahoo User Interface library is the Region utility which is part of the Dom utility. The documentation only mentions it and what it gives you but doesn’t quite live up to how powerful it can be in day to day interface development. Please refer to the accompanying demo page about YUI Region to see the examples in this post in action. the amount of pixels between the top side of the element and the top left of the window. the amount of pixels between the bottom side of the element and the top left of the window. the amount of pixels between the right side of the element and the top left of the window. the amount of pixels between the left side of the element and the top left of the window. Check the “Get occupied space of #1” link on the demo page to try it out. returns the total amount of pixels occupied by the region. The contains() method is pretty useful as it can tell you when and if an element is visually inside the other one. This can help immensely for drag and drop interfaces. You use it by defining the two regions and it returns a Boolean. If the element with the id reg2 is visually completely inside the element with the id reg1 contains will be true, otherwise it is false. You can try this out by clicking the “Is #2 fully inside #1?” link on the demo page to this post. Also resize the element with the “Resize#2” to see the change when you click the test link again and reset the element with “Undo Resize #2”. The union() method returns the screen region that encompasses both the elements. This is very useful if you want to cover both regardless of their positioning. The result is another region object. The intersect() method returns the screen region that is covered by both the elements. This is very useful to determine to what percentage two elements overlap or highlight the overlapping section. You can test both methods by clicking the “Show section containing both” and “Show section occupied by both” links on the accompanying demo page about YUI Region. Check the “Get dimensions of #2” link on the demo page to try it out. You can use this to for example read out the size of form elements and fix tooltips to their correct size. Say you have a DIV with the ID reg2 and a select box with the ID selectbox. The following script would position the DIV under and make it as wide as the selectbox. You can try this out by clicking the “Resize #2 to the size of the select” link on the demo page to this post. This is just a teaser on what you can use Region for. 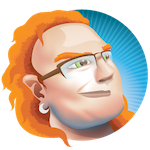 Widgets like the YUI menu or container use it constantly to determine if certain functionality can be displayed or not. I am currently in [tag]Hongkong[/tag] training colleagues from Asia on how we do things in Europe. Or so I thought. I came here with [tag]Douglas Crockford[/tag] and [tag]Nate Koechley[/tag] to show what we’ve done in the US and the UK to make life easier for developers to create web sites and applications. When we asked around for each team to show us what they work on and what things they needed input on we were in for a big surprise. It is pretty amazing what kind of implementations you see around Asian web sites and how naturally the developers here used the recommended technologies without ever asking or telling us about it. I can’t wait to bring back the findings the teams here documented to share with the folks back home. That said, I am also learning about problems us latin font users don’t get and only come up when you use Mandarin or Korean. All in all this is a great experience, both in terms of sharing information and realizing how much of your work for the web standards movement gets used without you ever being the wiser. For example I found a translated PDF of one of my articles I didn’t know before. The beef I had with that is that you need to repeat the name of the main object when you want to call one public method from another or access public variables. The other bit I was annoyed about is having to switch to object literal notation for the things you want to make public. During a Q&A session in a training in Hongkong yesterday I showed this to Douglas Crockford and asked him what he thinks of it. He didn’t mind the idea, but considered even the pub object redundant. This keeps the syntax of the whole script consistent and makes it obvious at the end which of the functions and variables can be accessed publicly. The other benefit is that you can reveal private functions with other, more specific names if you wanted to. Of course the example names here are far from what I would use in a real script, but it shows the power of this pattern.